HJ: Love begets love. And you attract as much love as you are ready to receive. It flows to you in direct proportion to the amount you accept it into your life. And the more give, the more you receive. However, you must first love yourself in order to be able to give. In actuality, you are pure love, but overtime we learn to judge ourselves quite harshly — we get insecure and criticize our ‘flaws’ and in the process cut ourselves off from much of our innate love. But by healing your heart and mind through doing your inner work, of which this site is intended to be a catalyst, you can begin to tap back into the inherent, infinite source of love that you truly are. Everyone desires to experience love with others. It is the greatest joy to feel love. We all know how to give love, but the problem is when we don’t know how to receive it. Not being able to receive love is a major cause for many of the frustrations we face in relating with others. It is the same thing for anything that we give but seem to have problems receiving it in return. If we are able to receive love as much as we are able to give it, we will complete the cycle of experiencing love with others for full happiness. We have been conditioned with the wrong beliefs that prevents us from receiving love. We think that it is pride to think highly of ourselves and expect others to think highly of us. That is why we do not openly receive compliments, adoration and all the gestures and expressions of love by others towards us. We turn away, try to hide from it and respond in all kinds of ways just not to appear as being proud, not knowing that we are actually rejecting the very love that is being given to us, than accepting it fully. Be aware of how you respond to others when they are showing love to you. Do you get uncomfortable when others are looking at you and sending thoughts to make them stop looking at you? When someone tries to be extra nice to you, are you unable to accept it because it feels weird? When someone shows you adoration and praise, do you shy away and in any way try to diminish their expression? How you respond is exactly how you treat the love that people are giving to you whether you know it or not. All the negative response that we make is the reason why we experience less and less expression of love from others. Each time they express love, we respond in a manner that says “please don’t show me love, I’m unable to receive it” and we wonder why other people get to receive all the love in the world but we don’t. We are the very ones creating all that we experience from other people. We program the way people treat us or don’t treat us. We reinforce other people’s behaviors negatively or positively. Instead of rejecting love from others unknowingly when they show it, receive it. Do not just accept it but embrace it. When they behave extra nice to you, warmly receive them and show with the look in your eyes that you embrace their expression totally with appreciation. When others compliment you, allow them to do so freely and thank them for it. Show that you see yourself as a person worthy of all the love that others can give to you, and that others are free and welcomed to give it to you when they do. There are those are so good at receiving love. They are able to attract all the love from others wherever they go. They act as if they are the star and everybody likes them. They are always expecting love and adoration from everyone and are showing it in the way they behave to you. They talk to you as if you admire them, like them, adore them, love them and want them. You can almost feel that they’re tugging on your heart strings and drawing love from you to them. They appear and behave as so loveable. Your relationship with love is mirrored in the external world in the way people respond to your love. Now you know why the ones whom you love and desire to express love to, can’t seem to receive your love. It is because you can’t receive love yourself. When others try to give you love, you unknowingly reject it. When you give love to the ones you love, you unknowingly reject them when they try to love you in return. When you can receive love from others, those you show love to can receive love from you. Open yourself to love by allowing others the joy of loving you. Give them the gift of loving you by being loveable and attracting love from them. This is the magic key to making others love you and be able to show it to you. Allow them to express love to you in their action, words and expression, and having it well received. Our world will be so much more beautiful when others are able to express love to us and have us receive it fully, and we are also able to express love to others and have them receive it fully. Some of us respond to love by an immediate counter expression of love. We are not really receiving the love when we give it back immediately. When someone says “I love you” to you, do not immediately respond with an “I love you” back at them. Take a moment to feel that love, receive it and let it sink in. Show that in your smile and the light in you eyes that you receive and appreciate it. Then out of the love that you feel, tell them that you love them. Do the same thing when responding to compliments. In order to receive love from others, you must first be able to receive love from yourself. Declare mentally “I love myself” and then let the feeling of love generate from your heart area and expand to fill your entire being. Imagine a white light of love energy wrapped all over you on the inside and outside. 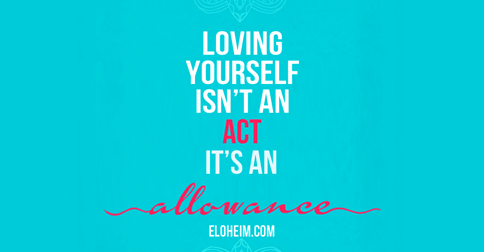 Feel the love for yourself as you give it unconditionally and wholeheartedly. When you step into any place with the feeling of complete self love, you’ll have an unassailable form that cannot be shaken by anyone. From the place of self love are you able to truly love others. Allow yourself to be so full of that love for yourself and being that love, that it just spills over onto those around you. Then you can start projecting that love onto others. Let the love expand and fill the entire space that you are in so that everything around you is filled with the love that you are. When you love others from a place of self love, they are able to love you back freely because you do not need them to love you back since you have love yourself. Enoch Tan aims to help people achieve greater awareness in living and experiencing life. To evolve human consciousness to higher levels. To change lives and transform the universe. To revolutionize the way we understand the mind and reality. Because that is what governs every area of life and destiny. Get free ebooks of the most powerful knowledge and learn secrets of mind and reality that will fully benefit you now at: Secrets of Mind and Reality. This is the most life changing information because it is about understanding and changing reality from the highest place of all!